Powerfull, uncoloured sound. Uncomplicated and simple to use. Fugly. But who cares, it sounds great. Well, let me firstly say that it's a shame that a supposedly German-design brand (Chinese-made, from Germany, just like the great sounding in this case hifi manufacturer "winning" solid state power amps but real honest ) makes a scum like this. This power amp "professional studio" produces a lot of noise EVEN NEW just buyed. It is the most harsh sounding amp you ever will hear. Mine was refunded by a famous pro audio german online store only used ONE HOUR: it was insupportable. I really this is is not true is a class AB amp. There is 2 options. Could be a really harsh and cheap class D switching ampifier or even worse: a "pure class B amp" with a toroidal transformer. Save your money for a "winner" sounding solid state hifi power amp that really makes a true class AB warm sound. I bought two of these after the dissapointing results(lack of bass, flimsy power button) I obtained with my Alesis RA500 I did not expected much but after connecting and let the system cooked for a while the results were as described in the Audiocritic review this little amp is pretty good and delivers a beautiful crystal clean sound there is a buzz in the rca connections but swapping to balance using a rca-trs connector the amp is noiseless. I bought my Behringer A500 used at a local music store. My existing home subwoofer amp was acting up, so I needed something quick. 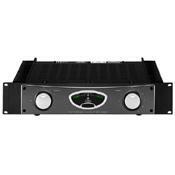 Since the receiver handles the basic crossover functions, this amp is very simple to set up and use. I don't have to "work around" a complicated subwoofer amp crossover. This amplifier is doing what i need it to do and it sounds fine performing subwoofer duty. What more can I ask for? I had the Behringer A-500 on loan to try out on my 2 channel stereo system. I've been an enthusiast for over 30 years and have listened to everything from the Dynaco tube equipment to current Linn and Bryston equipment. I'm not an audiophile because I don't change equipment every year. What I have is an antique Quad 306 power amplifier and matching Quad 44 preamp (unmodified with Quad cd card). I almost started to believe the Audio Critic rave review of the Behringer A-500 until I substituted it in my system. I listen mainly to classical music and it was immediately apparent that the Behringer does not have a grip on the music. The drama, excitement and refinement of a top notch orchestra is lost. The bass is generous but ill-defined. The violins are diffuse. My antique Rotel RX402 receiver (jaw dropping performance for a 1970's receiver) putting out 24 watts/channel is a David slaying Goliath (Behringer). If it's too good to be true, it probably is. The Behringer A-500 measures like a heavyweight at a ridiculously low price. If you are serious about music rather than equipment and technology, stay away from the Behringer. Like the previous reviewer I also bought two of these amps but unlike him I am using them in a domestic situation, not in a studio. Unlike the guy from the studio I have never used my amps bridged as there is plenty of power for the average domestic listening room. I run the amps either passively bi-amped or with a two way electronic crossover and am currently running my system in balanced mode via XLR's with balanced interconnects but they will run single ended with phono's. I have had several high end amps in my time which cost many times the fee Behringer charge and I have to say the A500's are easily as good as any of them. My speakers have very expensive drive units from Volt and Visaton ( ribbon ) so are revealing of bad electronics and they are excellent in all the normal Hi-Fi areas with no problems of hard treble when driven with the Behringers. The only fly in the ointment with the Behringers is if you run multiple sources as they only have one input. I only run digital CD & Freeview Digital radio which I can run into myCDP via sp/dif. If you use analogue records then I would look for something else. The other thing to watch is your speakers and Behringer recommends 8 ohm models. So to sum up I find them very pleasing in my system either doing rock, classical or Jazz. Lots of power for little money. Didn't run too hot, so don't need a fan unless you're going to be driving it real hard. Costs so little, it makes it a disposable product if you have problems down the road, just buy a new one. lightweight for portable use, but don't know how well it'd hold up if it was taken out on the road regularly. High frequencies could be harsh with cymbals and some with female vocals. Build quality is pretty cheap (plastic case, few components used inside). Popped off the top to look inside, bare bones component wise. Not much to the driver boards. Bought 2 of these amps. Good for the money, but made too cheap for critical listening use. Compared to the Crowns & Brystons that we already had in the studio, the Behringers weren't as refined or polished sounding. The treble was harsh with certain recordings. We used the Behringer at the studio to powered a pair of JBL LSR speakers and also a pair of B&W speakers, don't know which model. We also hooked the behringers to a pair of JBL MRX for an outdoor setup. Bryston amps usally power the B&W studio speakers, and crown amps are usually used for the outdoor speakers and also the JBL LSR studio speakers. In all the set ups, the Behringer had plenty of power for normal use. The JBL MRX's (PA speakers) would have been under powered if only one Behringer was used, but with two running each in mono, it was fine. Sound quality was fine except for some treble harshness. Bass was powerful, mids good too. Just some grain in the high end that we didn't hear with the crowns or the brystons in the studio. The treble harshness wasn't quite as bad with the outdoor setup, so the A500 would be fine for PA or sound reenforcement use. I mainly see the harshness in the high frequencies to be a drawback for critical listening/studio use. 1 year warranty. Not very long for a power amp considering how long they should last, but maybe it's enough to see if problems will develop. Behringer has had quality control problems in the past, but seem to be doing better. Time will tell.